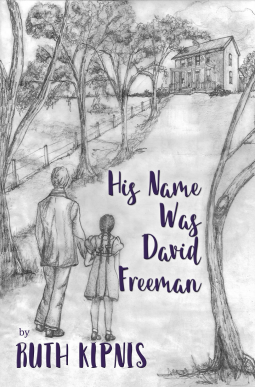 When I saw His Name was David Freeman by Ruth Kipnis in NetGalley’s Read Now section I thought it looked interesting and different from most of the other books I read. And it has an unusual cover. With the sudden death of his father, seventeen-year-old David is forced to leave the security of the estate his father managed in Prussia in search of an uncle living near Kiev in the Ukraine. Carrying with him the dream of owning a grand farm of his own someday. Fate plays into his hands as he’s given the opportunity to immigrate to America taking with him his new bride. In telling his story to his granddaughter he relives the joys, the sorrows and the hardships of raising a family in a world strange to him. Bewildered as the first generation rejects the old world customs and assimilates into the cultural, the story traces David’s family through the second and third generations from the 1880’s of the Russian Czars to 1960’s in America. Raised in Northern California, Ruth developed a love for horses at an early age. She and her husband raised their family in Woodside, California where they participated in the local horse activities from horse shows to fox hunting. Through a twist of fate they turned a hobby into a thriving business when they added a Thoroughbred Training Center to their already growing Thoroughbred broodmare operation. After retiring Ruth and her husband spent two years aboard their boat, the Paradigm, sailing the waters of Mexico. Settling in Puerto Vallarta they returned to the States seven years later for medical reasons. They purchased a farm in South Carolina filling it with ex-race horses. Writing came late in her varied career. Ruth believes all of us have some secret desire, be it to ride a bike, play a guitar, paint a picture, or in her case write a novel. Age should not dissuade anyone from the joy of following one’s bliss. Seeing her stories in print, knowing people are enjoying what she has written she says is reward enough. All proceeds from the book are donated to charity. Overall it is an enjoyable book – it’s a love story and a family drama. I loved the first part in which David tells his granddaughter Maya the story of his life. He was born in Prussia (later Poland) where his father worked on the estate of Count Frederic Von Zoransky. After his father’s death he went to live with his uncle in Grodov, a Shtetl (a small village) near Kiev in the Ukraine before emigrating to America in the late 1880s. The details of his early life, the horrors of the voyage to America and the difficulties the immigrants encountered are vividly described, bringing the story to life. The family’s struggles against anti-semitism, prejudice and hardship are fascinating. When he and Miriam, his wife, arrived at Ellis Island he gave his name as ‘David Freeman’ because he couldn’t chance using his real name in case he was identified as an Army deserter. He’d made it to America as a free man. I loved the descriptions of all the places in the book – I could see the hustle and bustle of Kiev, with its wide streets crowded with people and filled with fine horse drawn carriages. Similarly the farm in Connecticut that eventually David was able to buy with a loan from the Jewish Agricultural Society is described in fine detail. Whilst I did like the second part of the book in which Maya brings the story of her family up to date through the Second World War and upto the 1960s, I didn’t find that it had the same level of drama and appeal as the first part. There are also a number of grammatical and typing errors throughout the book. It does sound as though there’s much to like in this book, Margaret. I do enjoy a well-written family saga, and the settings sound terrific. I know what you mean about things like grammatical errors, though. They can be distracting. Still, sounds like a solid read overall. Margot, it is a good family saga – just a shame about the errors. I hate to be “that person”, but I will be: typographical errors, spelling mistakes, and bad grammar take me right out of a story. I lose confidence in the author and, after a while, although I know it’s petty, I find myself waiting for the next mistake rather than getting into the story. I think that if you’re going to go through the toil and effort of writing a book, at least hire a competent proofreader or copy editor when you’re done to give the book a final polish. Any book can have an occasional slip-up, but when there are enough errors throughout the book that it becomes noticeable, someone missed an important step.